Manufacturing job shops typically interpret a material specification of “ALUMINUM 6061-T6” as allowing 6061-T6, -T651 or -T6511. All of these are acceptable tempers, and are permitted for most applications. But, from years of experience, this is not necessarily the best interpretation. To explain, we will give a basic background in the metallurgical process differences for Aluminum 6061 – specifically in the area of thermally treated temper designations -T6, -T651 and -T6511. There are other designations such as F (As Fabricated), O (Annealed), W (Solution Heat Treated, naturally) and H (Strain Hardened), but they are not discussed here. Various industries have different material specification methods. On many prints, raw materials that specify aluminum are not very specific and simply state use “Alum 6061-T6” with no other designations. For the most part, this generic raw material requirement is used because a part may be fabricated from plate, extruded or rolled material. This gives flexibility to the job shop, and the engineer does not want to tie down the job shop due to an undefined manufacturing process method or material availability. Once a process is defined, the engineer or quality group should lock down the specific type of aluminum that is best for the application. Company quality groups can identify the material used from the prototype inspection sample warrant and material certification. Engineering can then update the print material designation for the production run. To understand some of the thinking, you need to understand the differences in the “T” temper designations. To get to the -T6 temper, the 6061-O aluminum billet is heated to about 990˚ F, then quenched in water, then aged at about 350˚ F for around 8 hours. That changes the typical yield strength from 8 ksi to about 35 ksi (ksi is a unit of stress, equivalent to 1000 lbf/in2). Quenching in water puts residual stresses in the aluminum, since there is a surface-to-center cooling gradient. The -T651 designation means the aluminum mill took that extrusion and gave it a 1% to 3% stretching, or permanent set, to get rid of some of those residual stresses. Now we can machine it and it shouldn't distort as much. Common specifications are ASTM-B209, and AMS-QQ-A-250/11 for plate. The final digit in the -T6511 designation (and how I know it was an extrusion, since this only applies to extruded stock) means that the aluminum mill is allowed to straighten the extruded bars, like in a press, to get the material to meet the straightness tolerances. Common specifications are ASTM-B221, and AMS-QQ-A-200/8 for rounds. Cold Finished, or also called rolled material, is designated as -T651, notice the extra “one” designation is missing. This applies to plate and cold finished rounds. The extra “one” is missing because the process is similar to plate. This material is commonly known as “screw machine stock.” This material has better manufacturing tolerances as compared to extruded. For example, a 1.000” diameter round bar in “close tolerance extruded rod” has a diametrical tolerance of 0.005’’, the “cold finished” is much more consistent, with a tolerance of 0.002’’. Additionally, a comparison of mechanical properties is very similar – both having a 35 ksi yield strength, but extrusion stock is 38 ksi ultimate tensile strength and cold finished is slightly more, at 42 ksi. Common specifications for cold finished / rolled are ASTM-B211, and AMS-QQ-A-225/8 for rounds. Chemically and physically, all of the tempers are basically the same, although the grain structure and additional stresses from straightening may be present (if straightened, and most bars are straightened) in the -T6511. Specification of the material is critical to manufacturing. Suppliers must control the temper of parts, even if not specified by the customer, to create the most consistent and best quality part. If this is not controlled, then some effects may include issues related to stress relief or cosmetic variations. For the many applications, stable and stress relieved material is important. The T651 is a better choice because when machined, this material creates a flatter part, due to the stability of the material. 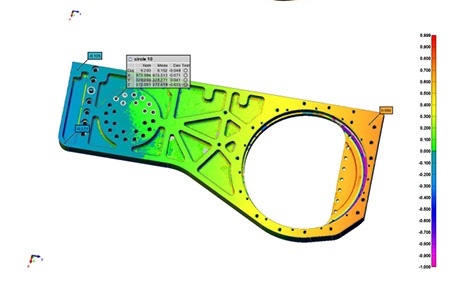 If extruded stock (–T6511) would be used, tolerances may require expansion or additional processes added to reduce part warping (iterative machining). The extruded stock may be less expensive, but an additional machining step may remove any savings. Laser scanned part made from extruded stock, showing warpage. Parts that require high cosmetic finish are highly sensitive to the type of raw material that is used. Due to the machining operations and media tumble operation, great care is taken to create a consistent and uniform tumble finish for class “A” surfaces. Again, the T651 material is the better choice because of the reduced grain structure and more consistent product alloy. 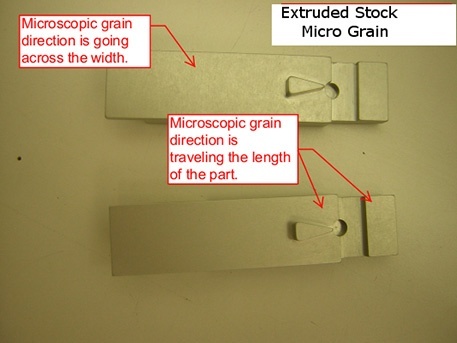 If extruded stock is used (T6511), the parts can show a definite grain direction. Cosmetic parts with a 90-degree grain direction may be highly undesirable. What is interesting is that these grain patterns will typically only be observed after anodizing. The extruded material will create a less consistent and non-uniform anodizing due to grain and alloy variations. Small alloy variations from the extrusion process create streaks of copper and silicon. This is shown as color variations of the anodize, such as dark blue to black or gold hues. Experimental trial evaluating using two sites of rectangular stock produced a grain pattern only shown after anodize. Extrusion have their purpose. Special shapes, such as heat sinks and specialty tubes, are best extruded. But keep in mind, they have more prevalent grain features after anodizing and will have more cosmetic variations as compared to plate or cold finished/rolled aluminum. Prior to production, confirm correct material callouts with the prototype manufacturer. This can be done from the provided material cert included with the Inspection Sample Warrant, or ask for our recommendation. Also consider modifying your drawing to include the QQ, AMS or/and ASTM specs prior to production. Leaving the material options open may create cosmetic inconsistencies, and it is best to define both the material and the grain direction on your prints. If you have any questions, please call Doug Wetzel at Protomatic Inc.